Food Costs > How Much Does a Papaya Cost? How Much Does a Papaya Cost? The Papaya is a fruit that comes from the Carica papaya, which is native to the tropics of the Americas and was first cultivated in Mexico. In the states, it only grows in Hawaii. The tree grows rapidly, bearing fruit within three years. Papayas are very versatile and can be used as a food, cooking aid, and even medicine. It can also be eaten raw without the seeds. At a local grocery store, fresh papayas can range anywhere from $2 to $10 each or close to $1 to $2 per pound depending on the time of the season, the size and the grocery store selling it. Because of its short shelf life, the geographical proximity can affect the pricing quite a bit. Depending on the type purchased, the average papaya can weigh as much as 10 pounds. Dried papaya can cost closer to $4 to $7 per pound, depending on the brand and where it’s purchased. Papaya seeds are also available for planting. These seeds are sold in packs of 10 and can cost $1 to $3 per pack. The United States Department of Agriculture Economic Research Service says fresh papaya can cost about $1.30 per pound, while dried can be $4.57 per pound. A papaya is a thick-skinned tropical fruit shaped like a melon. Its orange sugary-sweet flesh on the inside, as well as the smaller black seeds, will be edible. The skin won’t be edible. A green papaya, on the other hand, will be can be available pre-shredded for salads or whole and will resemble a football shape. This type of papaya will be firm and pale. There are two main types: the Mexican, which can weigh as much as 10 pounds, and the Hawaiian type, which is often seen in the grocery stores. It’s a great source of vitamin C, providing up to 144% of the daily recommended value, B vitamins, A vitamins, amino acids, several enzymes and folic acid. It will be in season from June to September. For every one pound of the fruit, most will get up to two cups of fruit. 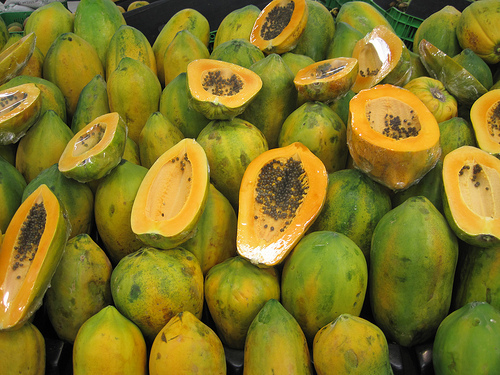 Green papayas can often be found in specialized Chinese and Southeast Asian grocery stores. A papaya is best eaten when it’s raw. While these fruits can be cooked, many experts recommend the best flavor is going to come out of when it’s uncooked. To eat raw, remove the seeds, scoop out the fruit with a spoon and enjoy. For more flavor, consider dipping in yogurt for a simple, healthy snack. A great seasoning that compliments this fruit includes cinnamon and butter. A great pepper substitute can actually be the seeds of the papaya. Pureed papaya can be a great way to help tenderize meats and can also be a great sauce for ice cream and even pancakes. A ripe papaya will be soft, yellow and won’t have any black spots on the skin. If the papaya is unripe, however, it can still be thinly sliced and can be cooked similar to squash. Purchase a papaya during the peak season in the summer. This is usually the best time to get the lowest price. Local farmer’s markets can often be cheaper than the chain grocery stores. Purchased at a local farmer’s market by the case. The case had 9 of them for $15.